My great uncle, Charles Chambers, lived in Tilbury but fell out of work. There was no public assistance available other than the town workhouses. A jug of soup and some bread were all the family had to eat from local charity; it was barely enough to keep them alive. Charles wanted to go to the “union” or “workhouse” which was the only refuge for the poor at that time, but his wife, Sophia, considered it a great disgrace and said she would go without food herself so that the children should not starve. With the opening of the docks, things got better. Charles got a regular job in the maintenance department of the dock company. Daughter, Jenny, left for domestic service (about the only opening available to girls of working class families). Charles moved his family to one of the new houses on a big estate built for housing the dock workers, but it was an unhappy contrast to his previous home in Kent . Although the houses were new, they were without roads and during the winter months they were unable to get out of doors. When the docks opened, an influx of “Irish and East End Londoners” moved into the neighborhood. Charles’ wife complained that they used bad language. Streets and shops were lit by gas. Sophia was very fond of the royal family but Charles was not as every royal birthday or occasion meant he would lose a day’s pay. 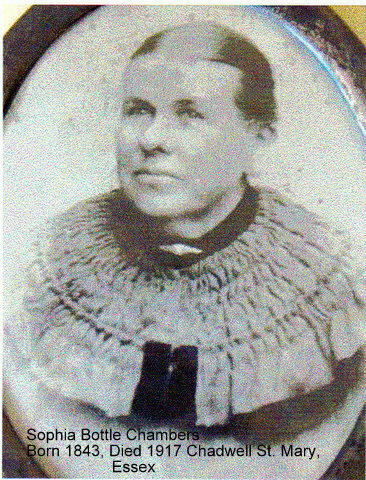 Charles and Sophia’s daughter, Charlotte, married Charles Baker in 1890 at Chadwell St. Mary, Tilbury. Charles had lodged with the Chambers family from about 1886. 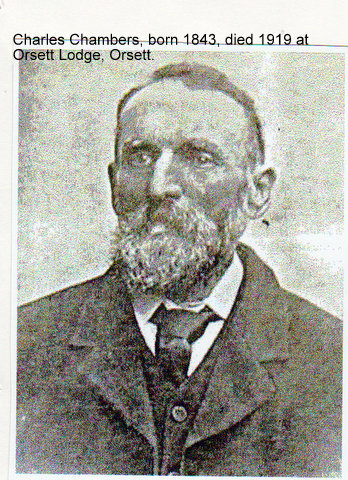 He was a labourer/caregiver working at the Tilbury docks in connection with the maintenance of the railroad tracks. He was very fond of sport and spent most of his spare time shooting wild fowl, of which there was plenty in those days on the marshland of the River Thames. He was later caretaker at 100 The Dwellings. Charles and Charlotte had seven children born in Tilbury: Percy, Daisy, Charles, Walter, Charlotte , John, and Sarah Rose. Percy worked as a steward on the passenger ships that came into Tilbury Docks. He used to bring home small cakes and buns which were leftovers from the tables. He used to carry his young brother up 4 flights of stairs to give him a bath in a big tub there. 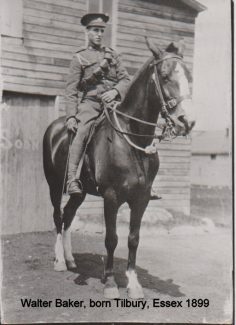 Percy was killed in France in WWI. Charles and Charlotte died young leaving their children orphaned. Three of the boys were sent to the Dr. Barnardo Homes and sent to Canada . Family members cared for the remaining children. Charles and Sophia Chamber’s son, Walter Chambers, was born in 1880. He attended school until the age of 12, which was required at that time. Children did not have toys but received an orange and nuts at Christmas. Walter began his first job at 10 1/2 milking cows, measuring the milk and cleaning out sheds. He was paid 6 shillings a week. After leaving school at 12, he got a job as a telegraph messenger. The work was enjoyable although he worked 12 hours a day six days a week and part of Sundays. Many messages had to be delivered on board the boats in the harbor. Does anyone have any information about the Baker family living in Kipling Avenue in the forties that might help Gil Geerings research? Hello my name is Gil Geerings and I’m a local WWII researcher. I live in Mol, Belgium and I’m trying to find as much information as possible of the soldiers who died in my town trying to liberate it. We want to keep history alive. One of the men killed in my town and buried is private BAKER, ALBERT SYDNEY. I know he lived in Tilbury, Essex on 60 Kipling Avenue. He was the son of Joseph and Emily Rosaline Baker of Tilbury, Essex. He was born on September 5th 1925 en was killed on 16/09/1944 when serving The Middlesex Regiment. I hope you can help me and maybe get me in contact with his relatives? My grandfather was Walter Chambers, born 1880, and brother to Charlotte Baker. I am writing up his memoirs, in which he talks of this time in Tilbury as a very unhappy period in his life, mainly because of the poverty, but also because the rough children at school made his life a misery. So I was very pleased to come across this article, by one of my distant relatives. I don’t know if it’s possible to pass my greetings on to whoever in the family posted this. i know it was over 3 years ago, but I can but hope! I also would like to know which of the uncles took the boys to Barnadoes. I hope it wasn’t my grandfather! I know they took in Lotte (Charlotte baker) and brought her up. Brilliant article! I’ve kept a diary since I was 14 years old and live in Tilbury till I was 28 when I moved out. Since 2000 I’ve been digitizing the diary and it’s currently 3/4 million words (1800 pages) and it’s all about living in Tilbury. I’m also a photographer, so I’ve got stacks of photo’s too from the 70’s and 80’s mainly, but there’s some old family ones in there as well. The only thing is time. with a collection as vast as mine I don’t get time to scan and make them available!